Somebody’s Hiding a Plane in Bushwick! There appear to be wooden pathways leading from the building to the tail of the plane, as well as circling the building. The buildings are part of Bushwick Houses, a 16-acre housing development between Bushwick Avenue, Flushing Avenue, Moore Street and Humboldt Street by the New York City Housing Authority from 1960 and has a great swimming pool open to the public that we’ve frequented on hot summer days. With nearly 3000 residents in 1,221 apartments and eight buildings, whatever was going on June 18th would have been pretty conspicuous to both residents and people walking by on the street. Maybe a film set? Okay, just kidding. A summer April Fool’s…The images are real but obviously a plane just flying overhead. But check out the pool in Bushwick Houses though, it’s a nice warm weather escape. 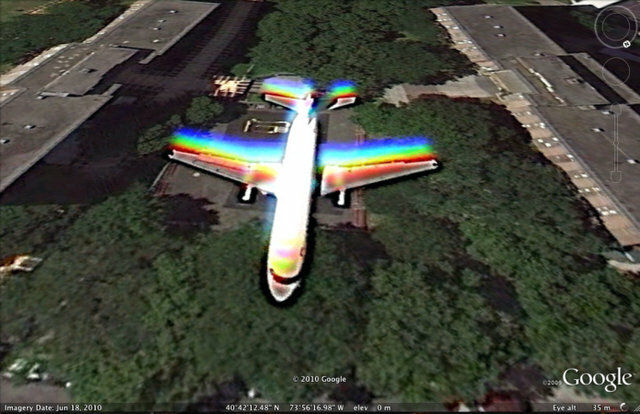 In this extreme Google Earth closeup, you can see that the plane is above the trees and the psychedelic colors are probably just from the plane moving faster than the satellite shutter speed. For more fun Google Earth images, check out the Untapped exploration of Manhattan, designed as Paris.Next, check out these notable archeological sites in NYC or the Secrets of Grand Central Terminal. Get in touch with the author @untappedmich. Photoshop. At least, in my opinion. Look at the shadows. OMG, this plane is flying in the air, there is no wooden bridge, or none of that stuff, it is to the park below it, WOW there are some dumb people! If you continue reading, it was a summer april fool’s we did a few years ago. We’re well aware it is a google image of a plane flying in the air and with our readers identified the make of the plane (you can see in the comments). But yes, a lot of people were fooled! If you line up the nose of the airplane to the north/south runway at LaGuardia, you can see it’s a perfectly straight line. How cool! What else do you know about this building? imagery satellites have different types of sensors: grayscale, red, green, blue. the sensors are arranged in a line, and each takes a photo as the satellite moves. each photo is taken at a different time, but at the same location relatively to the earth. then image is then created from the data of the different sensors. this is why there are problems with moving objects. so you should be able to figure out the height the image was taken now, given the size of the park and the wingspan of the plane, right? from reading blog responses, people seem to think the plane is a 737. Great post! I’m surprised this doesn’t happen more often. Here’s another one over Park Slope that I came across a while ago but didn’t think to post. this is great…looks like people have started finding some more on google! And yet another. All of these aircraft appear to be on the LGA Expressway Visual approach. This one has an obvious shadow just west of the airplane’s position.